There were fewer of us than usual in the dojo on Thursday, so we used the opportunity to analyse how we cut men and to break down the movement to its component parts with the aim of repairing each element before putting it in the correct sequence to make an effective men strike. Kendoka in the early stages of their kendo careers generally face three problems that affect their cutting action. Lift the shinai before they step into their own uchima distance, rather than stepping in whilst maintaining chudan kamae and then lifting the shinai and striking in the timing of one. Are unable to make correct footwork, because they are using the right foot to drag the left rather than pushing with the back foot, or lifting the right foot too high when making fumikomi, so that the left foot then flicks up in an arabesque movement to compensate. Or they use too much upper body power to make the cut. This can be a case of too much shoulder power or in many cases strength is concentrated in the right arm. Fixing these errors is not always simple; because cause and effect can become confused, and very often, bad habits in men striking are a combination of more than one problem area. We went through the analysis stage and acknowledged our own and each other’s faults then went through a series of suburi, footwork and uchikomi drills and people were starting to show some improvement, but I noticed that in several cases the cutting path of the shinai was not following a straight natural line through the centre of the body. This led me to a eureka moment when I remembered an experiment conducted by an elderly sensei at the Kyoto Taikai a few years ago. He had set up a device which looked a bit like a tall music stand in a space behind one of the bogu stalls surrounding the Butokuden. The stand had a frame with clamps on either side into which he inserted a broadsheet newspaper page. He then challenged all and sundry to cut through the newspaper using a shinai without fittings. There were various results from kenshi of varying grades. Those who used far too much strength just ripped the paper out of the frame. Those who put just too much power in the right hand made an uneven zigzag cut and those that were totally relaxed and centred cut the paper down the middle in a perfectly straight line. Recreating this seemed the perfect way to demonstrate how to cut correctly, so I asked if anyone had a newspaper and someone obliged with the evening free-sheet. We took turns at holding the newspaper pages and everyone, me included took turns at cutting. The result across the board was that the page floated towards the ground in one piece whilst the holder was left clutching the two top corners, leaving me to reflect on why it didn’t work. There are four possible answers. The newspaper was wet; you need a frame to hold the paper properly; our cutting was not good enough, or it does not work with the London Evening Standard only with the Nihon Keizai Shimbun. 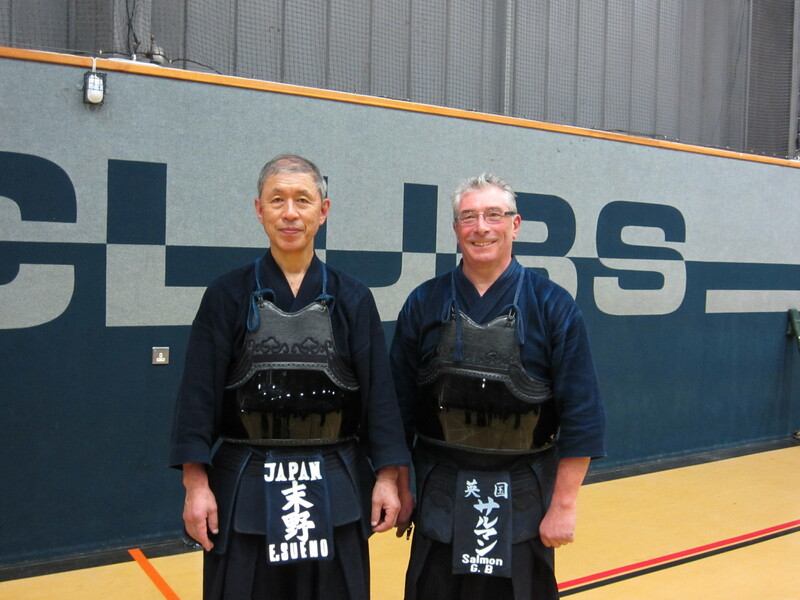 Sueno sensei, hanshi hachidan and 1979 All Japan Championship winner from Kagoshima, is currently in the UK and has just given us a very interesting seminar. At the opening stage, he stressed the importance of continuing suburi throughout your kendo career and made the point that ”if you can’t do suburi, no matter how long your kendo experience, you can’t do kendo”. He instructed that the path of the shinai in suburi should be smooth, in line with the centre of the body and close to the head and that we should use all three joints; shoulders, elbows and wrists. He also insisted that we should ensure that we use the muscles in the underside of our arms rather than those on top. To achieve this, we should pull our arms back past the midpoint of the top of our heads and feel these muscles engage before starting the downswing. Once this has been achieved and the muscle memory kicks in, we are able to make our upswing smaller and smaller and that in keiko or shiai, the cut can be as small as you wish as long as it has impact.. We should not pull our elbows out and arms should remain relaxed. When viewed from the back our shoulder width should not change throughout the whole striking process. Sueno sensei also talked about the old commonly taught concept of shibori (wringing the hands on completion of the cut), being incorrect and that we should not change our grip from beginning to end of the cut. He explained that the hands throughout the cut should be in kirite (cutting hand) position, although they could be extended in nobite (extended hand) form to lengthen our reach on impact. He also torpedoed the old myth that we should straighten our right arm on cutting men by demonstrating that doing this gave a 4 to 5 centimetre reach advantage, but that the resultant body imbalance caused us to lose 30 or 40 centimetres of distance from our footwork. Sensei then went on to take us through a sequence of waza geiko, uchikomi geiko and kakarigeiko exercises, constantly reinforcing the concept of accurate relaxed swing. The other key point that was accentuated was correct breathing. When you breathe in you are open to attack, so before you enter fighting distance, you should breathe in quickly and conserve your breath in your tanden until you can conclude a successful waza. Finally he made the point that if you miss with your attack you should keep going until you make a successful strike. Although I was there in an assistant instructor role, the temptation to try things myself was overwhelming. The highlight of the seminar for me was a keiko with Sueno sensei, who was of course, impossible to hit. As the old song goes “It don’t mean a thing, If you ain’t got that swing”. Many kendo students dread the practice of suburi. It is regularly incorporated into the pre-keiko warm up and is viewed by some as an exercise to develop stamina and strength. Even when this is not the intention, suburi is often conducted at a speed that is beyond the capabilities of many of the class members; in some cases beyond those of the individual leading the session. It can be quite frightening to watch a group of earnest kendoka, thrashing around like demented metronomes, each in their own space and time; desperately trying to keep up with the group. It is also worrying to see carefully cultivated technique thrown away in order to go faster. Before I rant on, let me make it clear that I actually value suburi as an important part of kendo training, but it has to be done correctly; at a speed that the slowest group member can match without compromising technique. In the same way that golfers use practice swings, suburi is a great tool to ensure that all the component parts of a strike are correct without the pressure of facing an opponent. Shoulder, elbow and hand movement; tenouchi, balance, footwork and ki-ken-tai- ichi can all be coordinated in suburi, but you have to allow the time to get it right. Currently some of the more experienced kendo teachers will use suburi as the basis for teaching a technique. They then build on it through a progression of exercises that take it closer to its intended purpose. So for instance, the students practice a men attack as individual suburi, then put on men and kote and work with a partner on hitting from correct distance; finally trying full speed uchikomi geiko with fumikomi. Suburi also allows you to train without an opponent and can be adapted to any waza you wish to work on. Not only can we use the standard methods of jogi buri, shomen suburi, zenshin kotae shomen suburi and choyaku suburi, but we can be more adventurous and try renzoku waza as well. If you need to practice at home and you are worried about the light fittings, then you can buy special suburi shinai, which replicate the weight of a normal shinai, but are much shorter. With enough imagination, you can just use your hands. Of course there is no reason why suburi cannot be used to make your attack faster, but my advice is to get it right first and then make it quicker. I am travelling on business in India and it has, unusually for me, been a week since my last practice and I have got another week to go. I understand that there is kendo in Delhi but that is a long way from Mumbai where I am currently based. 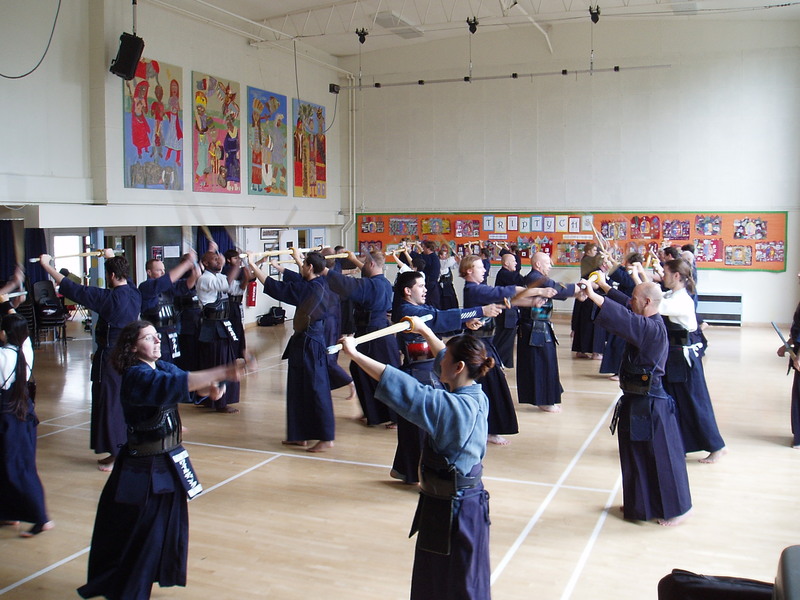 Having spent most of the time sitting in air conditioned cars and offices it is difficult to keep kendo fit, so I have been looking at ways to practice on my own, without a shinai. The answer is of course suburi in front of the mirror in my hotel room. It is not as strenuous but as the real thing but it gives me the chance to concentrate on important aspects like posture and footwork. The only downside is that without the disguise of keikogi and bogu, the mirror tells me that I have had too many beers and curries. Nevertheless, I have tried to combine quality and quantity by working on a continuous series of 1200 suburi, starting from shomen and yoko men but then graduating through all the techniques I use. There is no reason why suburi has to be basic so I tried to simulate debana men and degote and then with dou did the same technique in both nuki and kaeshi form. I even attempted tsuki and finally tried kote nuki men. It is certainly not the complete kendo exercise but it has made me look at my technique in detail and what’s more persuaded me that I now have room for another beer. With luck I will back for practice at Mumeishi next Sunday.